As the civil war in Syrian dragged on and continued to devastate the country’s cultural landscape, and European institutions fretted about how to save the country’s archaeological treasures such as Palmyra and the Crusader castle Krak des Chevaliers, some Syrians were preoccupied with an altogether different dilemma: how to save the country’s modern art. Though still largely undiscovered outside of the Middle East, Syria was the site of one of the region’s most vibrant modern art scenes, but now this art— and the artists who created it— were in danger. The task of making sure that they survived would fall largely to the Syrians themselves. 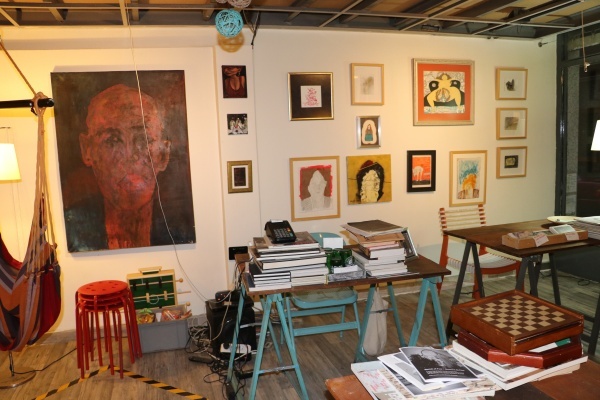 Today, the Arthere gallery, an art space, artist atelier, and café located in the Kadıköy neighborhood of Istanbul on the Asian side of the city, helps to tell the story of how some Syrian artists have managed to navigate the war, and of the unexpected cultural renaissance of Syrian art that has been one of the rare bright lights among the country’s recent horrors. In speaking to its initiator, Syrian photographer Omar Berakdar, I discover that even though it exhibits and sells paintings, Arthere is in fact not a gallery: it is something more akin to an artist’s agency or collective: a place where Syrian artists in exile can meet, share, work, and above all find the means to return to their art while living a wildly uprooted existence. To understand the need for an artists’ collective for Syrian refugees in Istanbul, it is perhaps necessary to return to the decade before the Syrian Civil War broke out in 2011. Though Damascus had rarely been thought of as a center of contemporary art, that changed as the atmosphere of Damascus began to open to the wider world, with boutique hotels and chic restaurants taking root within the walls of the old city. In 2010, just a year before the onset of the war, the New York Times listed Damascus as “the next Marrakesh,” and ranked it among the world’s top travel destinations. 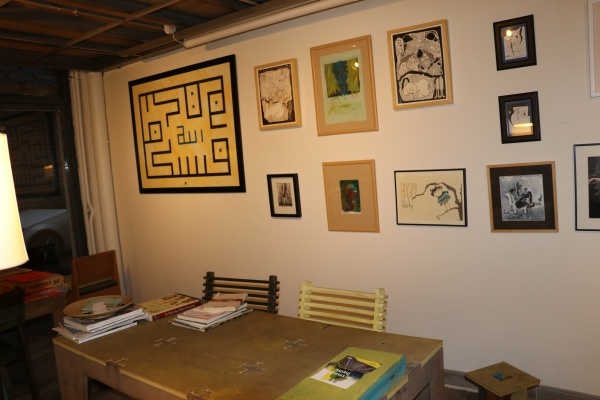 The Ayyam Gallery, now perhaps the most famous exhibitor of Syrian art from its galleries in Dubai and Beirut and founded by a pair of cousins with Syrian origins, opened a gallery in Damascus in 2006. There they discovered a mine of untapped local talent that had not been introduced to a wider audience– perhaps not surprising from a culture that has long been famous for its craftsmanship. But when the Syrian uprising began, many artists, writers and filmmakers found themselves at the center of the opposition movement against the Syrian government in the early months, emboldened to express themselves freely in an astonishing outpouring of paintings, sketches, music, and film. Several prominent artists lost their lives, from the cartoonist Akram Raslan to the film maker Basel Shehadeh. Others fled. Berakdar, a prominent photographer, left Damascus in 2012 and arrived in Istanbul, along with a wave of other Syrian artists, many who escaped without their families. He briefly returned to Damascus in 2013, then decided he was in Istanbul to stay. “I can’t live the rest of my life keeping my mouth shut,” he told me. It was not long before he realized that Syrian artists in Istanbul badly needed a place to meet. “The idea is that the Syrians do not know anything about the art world, so the minute you bring them here they are in alien circumstances,” he told me. “They lost all of their tools, which is the nephew they know, their uncle…” He added that in Syria artistic talent often did not matter nearly as much as connections to powerful figures, gallery owners, or institutions that provided support. In exile these connections disappeared. Artists were uprooted from their means of navigating the world. The result was both a burden and an opportunity: Syrian artists with no powerful connections at home now had the chance to succeed in exile solely based on their talent—and since visual art didn’t depend on mastering a new language, they could get to work right away. Artists used to holding their tongues due to censorship were now also emboldened to fully express themselves. Yet the challenges were immense. 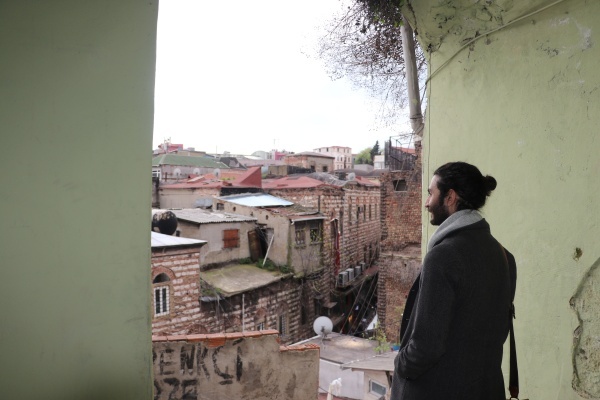 Young artists in Istanbul had to learn an entirely new system, one that involved finding exhibition spaces and writing grant proposals, submitting to online galleries and forming concept statements, often written in foreign languages. Artists who arrived in Istanbul with no family, little more than a suitcase, and often desperate to earn enough money to smuggle themselves to Europe became easy targets for exploitation. This is where Berakdar—who is Syrian but also has French citizenship, and is well versed in the European art world– stepped in. His goal is to empower and educate artists about the new world they have found themselves in, to help artists without judging them, to provide them with guidance on selling their art and applying for grants, to give them a space to exhibit, and to encourage them to imagine a future as artists. 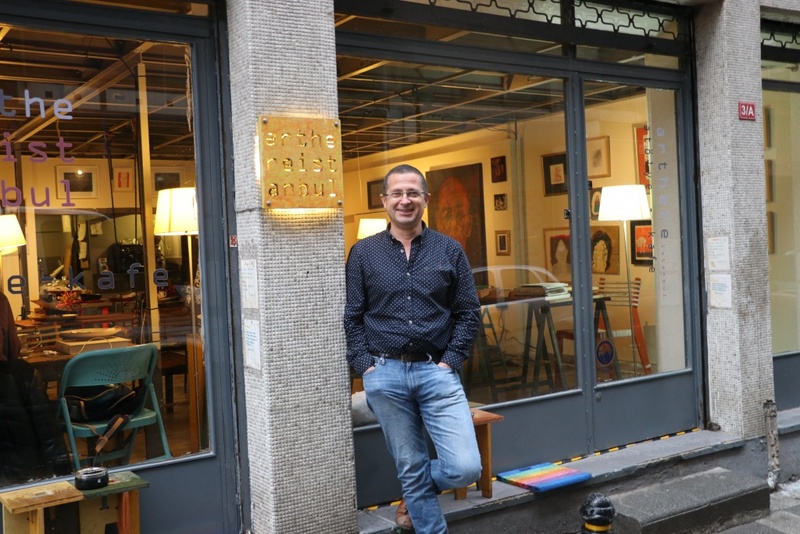 He also encourages Turkish and international artists to frequent the space so that they can build a diverse artistic community in Istanbul that works together. His larger message is that programs to aid Syrian refugees are destined to fail because they are run by outsiders who are incapable of meeting Syrians where they are. While the walls of Arthere appear simply to exhibit art, on closer inspection they tell a larger story of Syrian heritage, covering the length and breadth of the country. The immense, haunting portraits of Ali Omar, a painter from the small Kurdish village of Tepke in the north-east of Syria, hang on some of the walls. His works represent the rural life of the al-Hassakah province rarely seen in art. He paints the same male figure over and over in his works: even he cannot articulate exactly who he is or what he represents. One of the haunting portraits of Ali Omar visible on the cafe wall. 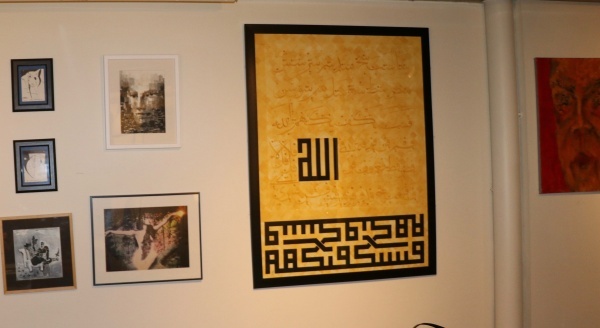 Mohammad Imad, a calligraphist from Aleppo, creates modernist, cubist variations on traditional Islamic calligraphy, drawing on his city’s rich Islamic heritage. Berakdar gives him as an example: he felt pressure to create ordinary, classical calligraphy instead of the modernist visions that came naturally to him. Berakdar urged him to trust his own vision, including exploring more secular themes in his art. “He says that calligraphy is not about the sacred word. It’s about making the word sacred,” he explains. A piece of modernist calligraphy by Mohammed Imad from Aleppo. 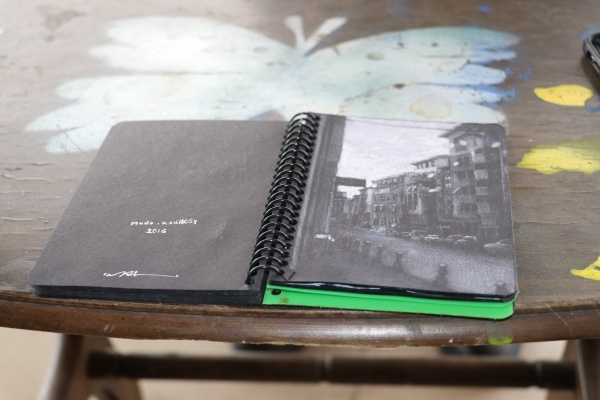 Imad Habbab’s artist notebook contains small, highly detailed sketches often done on public transport. Other artists who participated in Arthere have already taken the treacherous journey by sea to Europe, leaving their belongings—and precious canvases— in Berakdar’s care. Some of the canvases are in an artist’s vault; he’s carried many others to Berlin in his luggage on his own trips to Europe, reuniting artists with the canvases they left behind. He takes me down to the basement, which holds a collection of old bags and suitcases from Syrian artists who have fled Istanbul to Europe, storing with Berakdar their medicines and odd sentimental items from Syria such as packaged foods and Syrian brand cigarettes that they couldn’t bring themselves to part with. It occurs to me that that room, with its scattered fragments and memories, is its own collective piece of art. 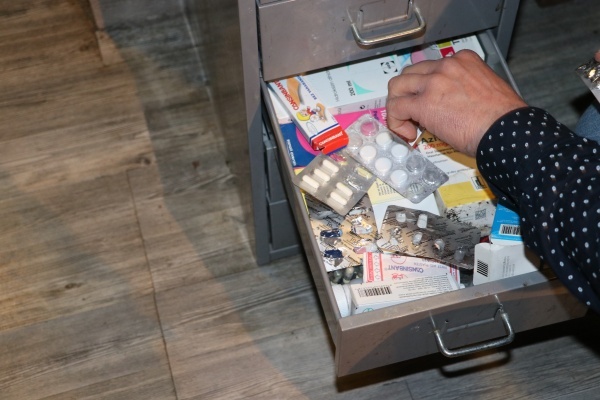 Medicines left behind by artists who have made their way to Europe. Barakdar is hardly alone in the work he does as a Syrian advocating for other Syrian artists. Khaled Youssef, the Syrian photographer, has founded the website SYRIA.ART based in France, which aims to bring attention and encourage the collecting of Syrian artists based in Europe. The Ayyam Gallery, which helped to relocate many of its artists as well as their artwork out of Syria, has helped to launch the careers of famous Syrian artists such as Tammam Azzam and Abdalla al Omari. Raghad Mardini restored a series of horse stables in Lebanon and turned them to artist ateliers when she saw that Syrian artists in exile had no place to work. She recently founded Litehouse Gallery in London, an online gallery for Syrian artists that also hosts pop up exhibitions of Syrian artists. And there are other’s whose names we do not know: Behind the Lines, an exhibition of 19 Syrian artists in Calgary, Canada this year was only made possible because an anonymous Syrian artist smuggled the works out of the country.